extended until 1st September, open by appointment only. image: Andrew Curtis 'Assorted Originals' paintings nos. 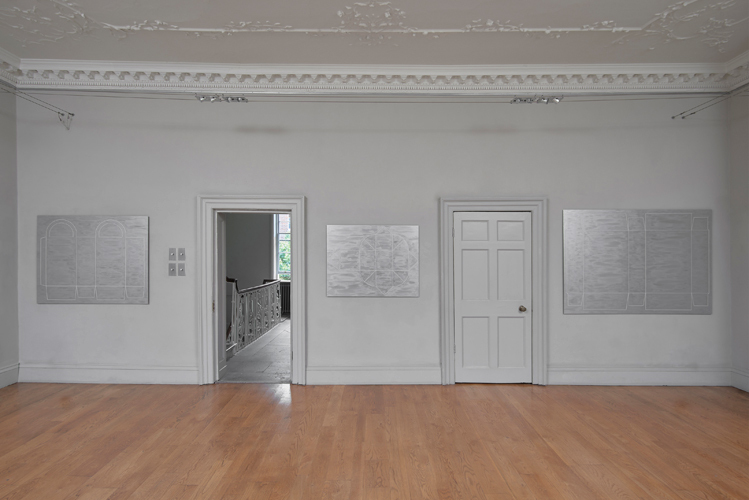 1,8 and 7 from the list below, all aluminium paint on Dibond, 2018, installation photo by Andy Keate. "The ordinary–sized stuff which is our lives, the things people write poetry about–clouds–daffodils–waterfalls–what happens in a cup of coffee when the cream goes in–these things are full of mystery, as mysterious to us as the heavens were to the Greeks." Human beings' near–constant desire to idealise, construct and repackage reality has (inevitably) resulted in a landscaped hyperreal world that is as limited and unsatisfactory as it is false. Two centuries of coaxing wild waterways into canals, uprooting mature trees from erratic woodland spots to be replanted at measured intervals along city streets, and occupying marshland with smart new build development has tamed once ungovernable terrain into green and pleasant land. What isn't farmed is suburb. Life comes flat–pack with a manual, child–locked and ready–for–use. Escape is as futile as it is undesirable. If chaos rules then where on earth does one walk the dog, or park the car, or sample the local honey?